It’s official, my little spunky Elle is 3. I haven’t thrown a birthday party for her with friends until this year. And it worked out great. This was the first year where she actually understood birthday parties and celebrating with friends. I kept it simple and just went with a color theme. Elle loves pink. So it was only appropriate for her to have a pink party. As previously mentioned, I was looking for a place to do her birthday party outside of our home. And since it is January, it was best to have it indoors with unpredictable weather. 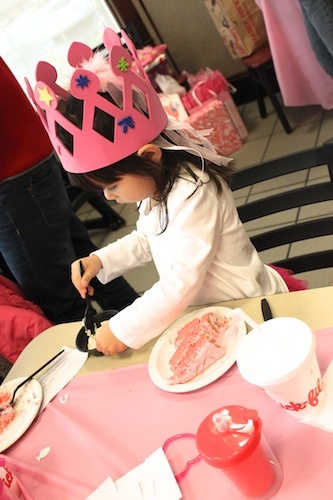 We had it at Chick-Fil-A, her favorite place to eat. This was also the first time I planned a party outside of our home. It was so nice. I showed up and everything was decorated and ready to go. All I had to do was the birthday cake. Although I did make a few extra things to make the party a little more personal. Yet the best part was I didn’t have to clean up before or after the party. Nice. 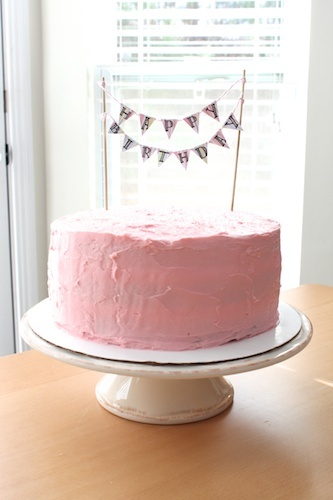 Going with the pink theme, I made Elle’s birthday cake a pink strawberry cake with pink strawberry frosting. It was a triple layered cake and I sprinkled clear sugar crystals on top. 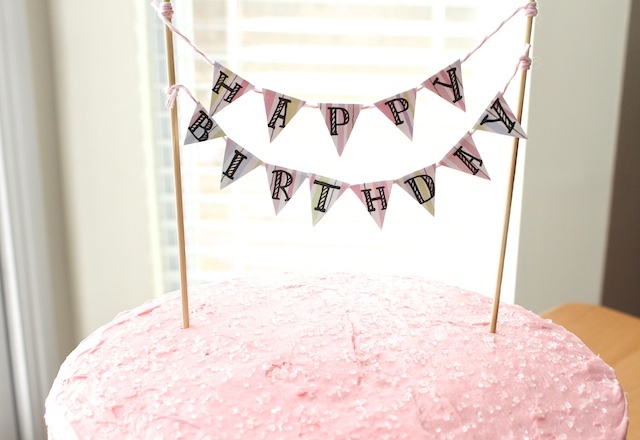 Then I made a bunting garland to go on top of the cake. Then I made extra strawberry cupcakes because I wasn’t sure if the strawberry cake was large enough to feed all the guests and their parents. 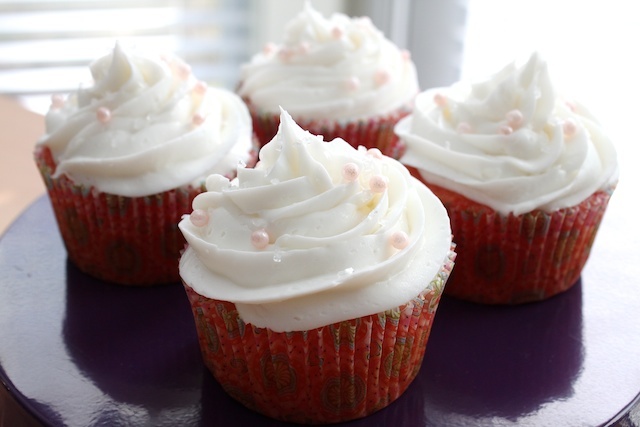 So I whipped up these cupcakes with white frosting and then sprinkled clear sugar crystals and pink sugar pearls. I also made name place cards for each of the birthday guests. I wrote out each child’s name in fancy lettering and added a little flower to it. We did have two boys come to the party and they were such good sports about being at a pink party. 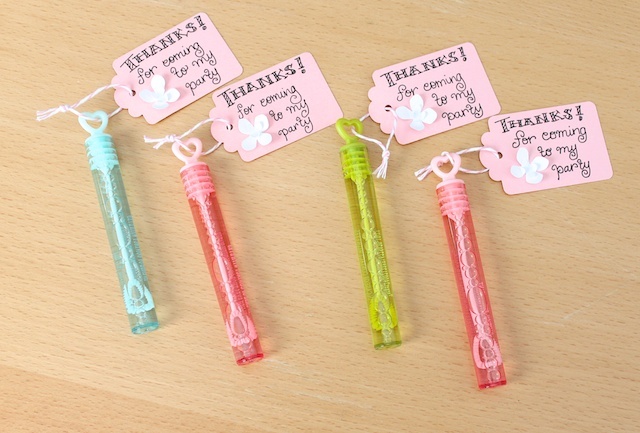 And although the restaurant provided the goody bag for each child, I wanted to add a little something extra with a tag that said “Thanks for coming to my party.” Originally I had wanted to make cake pops. That didn’t turn out at all. So I resorted to bubbles which worked out perfectly. The party went perfectly. We had 14 children ages 3 to 5 at her party. 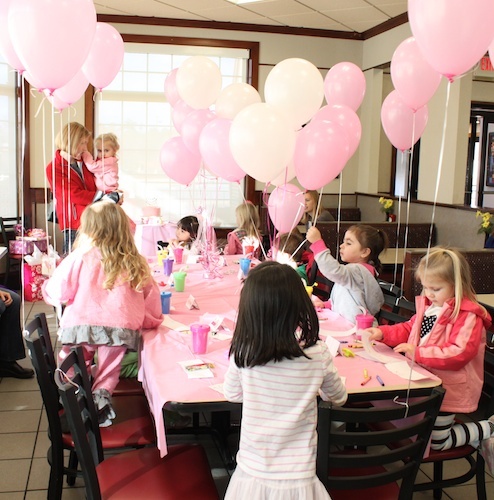 The party started with a little craft provided by Chick-Fil-A where they colored a long strip of paper that went in a straw cup. Then as the children were waiting for their food to be served, I brought another craft to keep the children occupied. I brought foam crowns and glasses for them to decorate with stickered foam shapes and letters. When it was time to eat, the children were so quite devouring their chicken nuggets and french fries. 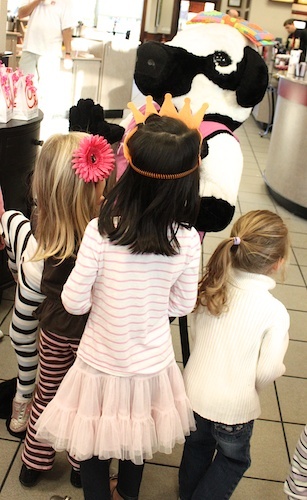 After dinner, the restaurant mascot, came out and greeted the children. This one was a girl cow named Daisy. Some of the children were afraid and wouldn’t get near the cow. Others gladly sat on her lap. Once the cow left, it was cake and ice cream then open presents. Everyone was gone shortly after that. The party lasted two hours and we all went home happy. I love this girl to pieces. She is so much fun and just had a blast celebrating her birthday with her friends. And it was so nice to not have to do everything. All I did was the small details that made the party just a little more personal. I can’t even express how amazing it was to come home from her party to a clean house. 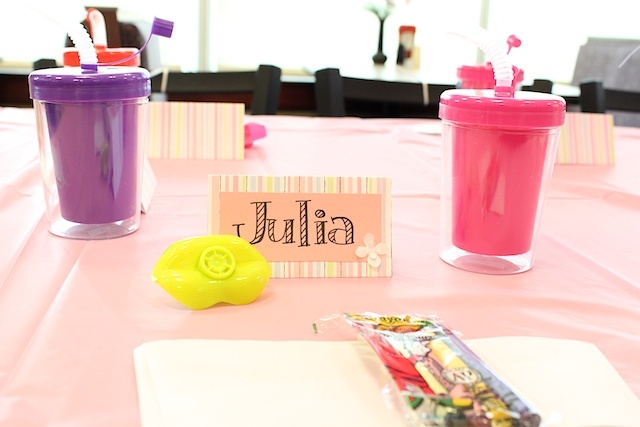 » Tell me… How do you keep parties/play dates under control at your house with a group of little ones? Pinkilisious ! love it ! happy birthday ! Love the pink! Looks like a perfect party! Happy birthday Elle! 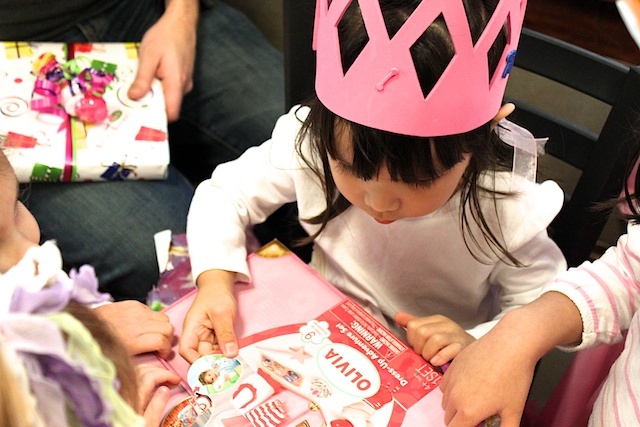 My daughter turns three in a few months but we haven’t talked about birthday parties. I might hold out as long as possible and just have a family celebration if I can get away with it this year. Happy Birthday, Elle! The pink party looked absolutely perfect. The cake and cupcakes were so fun, gotta love edible sparkle. LOVE the cake! It is very cute. You did an amazing job. And the cupcakes look pinkalicious as well! We just had a double birthday party for our kids who have birthdays just a few days apart and it took DAYS to clean up. I think we’ll do it somewhere else next time. Thanks for the great idea!!! Simple, but beautiful and very special! 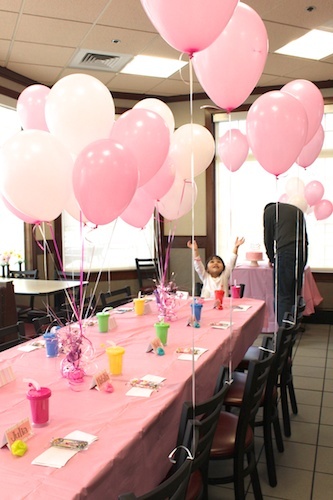 Pink birthday party can be organized for the girls only as the girls like the pink color most. Apart from this just don’t make everything pink.